Some of the simplest things that people don’t think matter actually do matter. Your envelopes are one of them. You can make a person really want to open the envelope or make them feel like throwing it away. Here are some ideas to help your envelope get opened. How important are envelopes? More important than you might think. Envelopes are the first thing a customer or prospect sees in a mailed correspondence, such as a sales letter, statement, or piece of direct mail. They’re the billboards of the business world upon which endless messages can be written and impressions (both good and bad) made. Think this is an overstatement? Think again. A recent marketing study found that people prefer receiving direct mail the old-fashioned way – through postal mail – rather than in their email. That’s right. They want printed pieces they can hold in their hands and read at their convenience. This means the humble envelope is your first, best chance to connect with them, short of being there yourself. Envelopes are your envoy. Recipients will judge their contents – and its value – on the kind of impression the envelope makes. Your printed envelope should send a strong sales message and provide a call to action. They should offer a promise of exceptional quality and be intriguing enough to encourage the recipient to open them. So how can you accomplish all of this? High-quality paper will make the end user think of your quality. Color evokes emotion and creates attraction. Compelling graphics and interesting copy add to the intrigue. These elements, used separately or in combination, can make any envelope more effective. This is true whether you’re talking about standard #10 business envelopes used for general correspondence or specialty envelopes used for any of a million other purposes. So don’t overlook your envelopes and the marketing power they hold inside. 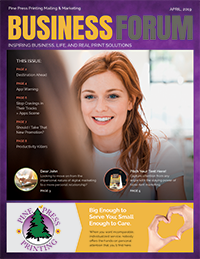 Read more helpful business tips from Pine Press Printing in our monthly Business Forum.